When my boys were young, we lived in Switzerland for an idyllic two years. Each Monday morning, it was my turn to drive carpool to nursery school, picking up little Danny and Laura. On the way home, I would stop back at Nancy’s, Danny’s mom, and just about every Monday, she was taking her Blueberry Buckle out of the oven when I arrived. 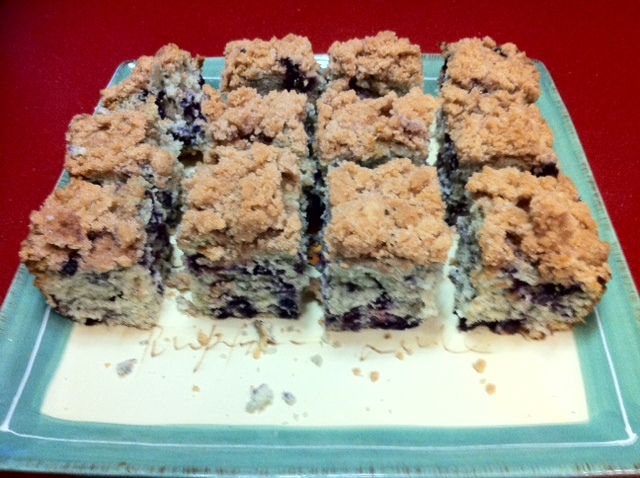 I serve the Blueberry Buckle now, too, sometimes on Mondays, and treasure my Swiss memories. Grease and flour a 9″X9″ glass baking dish. Cream the butter and sugar together. Add the egg and vanilla and beat until light and fluffy. Mix the flour, baking powder, and salt. Alternately add the flour mixture and milk to the butter mixture, beginning and ending with the flour. Add the second flour to the blueberries and lightly fold into the batter. With a pastry blender, mix the topping ingredients together and sprinkle over the batter. This entry was posted in Birchwood Inn, Desserts, Sweet Breads by admin. Bookmark the permalink.